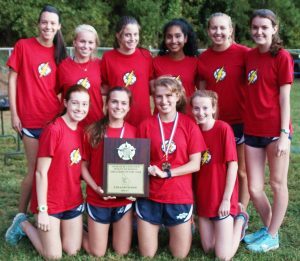 The Dunwoody Lady Wildcats and Lakeside Vikings unseated the 2016 champions with victories in the girls’ and boys’ DeKalb County (DCSD) Cross Country Championships on Tuesday at the Druid Hills Middle School Course. The 42nd running of the girls’ championship became Dunwoody’s seventh title in the past 10 seasons and eighth overall with a 36-44 victory over the defending champion Lakeside Lady Vikings who holds a DeKalb County leading 16 titles. Dunwoody senior and 2015 Class 5A individual state champion Samantha Cameron held off Chamblee senior Beining Xiao (20:28.80) by 24 seconds to capture the title with a time of 20:04.60 which is the best girls’ time ran in DeKalb County this season. Cameron was one of three Lady Wildcats to finish in the first five as senior Kelly May Sheehan was third in 20:29.00 and sophomore Anna Mothner (20:49.10) was fifth. Lakeside also had three in the Top 10 led by Emma Hanson (20:34.50) in fourth, sophomore Sydney DeWoody (21:54.70) in seventh and just behind in eighth was junior Abbie Hunter (21:49.60). Dunwoody senior Nina John crossed in 22:32.50 to take 11th overall as the race tightened. Lakeside Santai-blu Boyd (22:40.20) was 12th and Eliana Blam (23:40.60) was 13th. 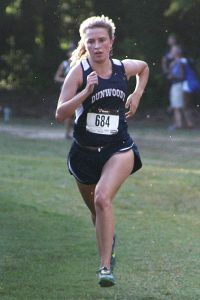 Senior Chloe Thomas (23:08.70) came across the line in 16th to seal the win for Dunwoody. Druid Hills was third with 66 points led by freshman Reese Rathur (23:23.69) in ninth and senior Lisa Medford (22:32.50) in 10th. Chamblee wound up fourth with 77 points with Xiao in second and senior Paris Williams (21:51.90) in sixth. The Lakeside Vikings turned the 54th running of the DCSD Boys’ Championship into a 31st title with a convincing 22-77 victory over Dunwoody supplanting the 2016 champions Clarkston Angoras as the top team in DeKalb County. Six Vikings ran to Top 10 finishes led by senior Jake Tubesing’s individual title in an excellent time of 17:02.10 with sophomore teammate Mikias Mekonen just behind in 17:03.80. 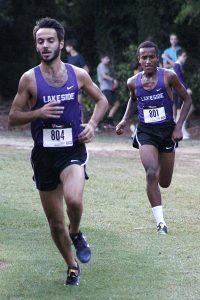 Senior Myles Boyd crossed in fourth with a time of 17:19.10 while juniors Jay Clinton (17:35.80) and William Nelson (17:39.10) were seventh and eighth, respectively. Daniel Martinez was the sixth Viking to cross with his 10th place finish in 17:49.90. This was the third consecutive year for all the Top 10 to come in under 18 minutes. Dunwoody’s second place finish was fueled by sophomore Max Mowrer who took the bronze medal with a time of 17:10.10. Defending champion Clarkson was just behind with 79 points led by junior Mathurin Allawai’s ninth place finish in 17:47.80. Fourth place Druid Hills followed the lead of junior Carter Rathur who picked up a fifth place ribbon with a time of 17:27.10. 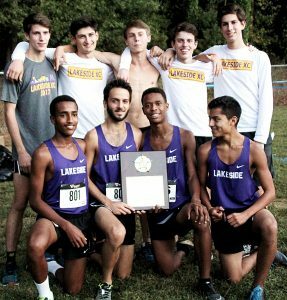 Lakeside has won or tied (1995 with Stone Mountain) 20 titles in the last 23 years of the boys’ championships giving Coach Rick Barbe his 10th title at the helm of the program. Clarkston’s three titles (2013, 2014, 2016) are the only times the Vikings did not finish first and they were the runners-up in all three of those seasons.